Today I have a treat for you! The lovely Kelly of Paper Meets Pearl has answered some fun questions. So have fun getting to know this sweet girl and hopefully some of you will learn something about blogging from her! Hello! My name is Kelly and I’m the blogger behind Paper Meets Pearl! 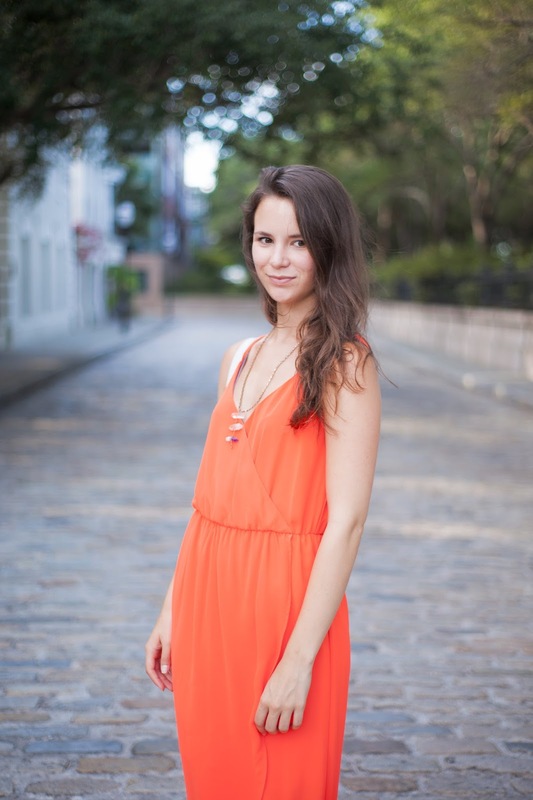 My blog is a fashion/lifestyle blog based out of gorgeous Charleston, SC. By day I’m a marketing/social media guru and by night I’m a blogger and fashion stylist! I first got started back in January after making a New Year’s resolution. I honestly owe a lot of my blog’s start to my supportive boyfriend for challenging me to do it. I’ve always loved fashion and writing but was always told that it wasn’t a viable option. Ever since I got started I’ve been able to meet some amazing ladies (like Katie!) and work with terrific brands. Oh gosh! That’s difficult because there will always be challenges with blogging. I would have to say staying motivated and inspired to come up with creative content. I try to keep a notebook handy so I can jot down an idea so I don’t lose it. I would say it’s a cross between minimalism and boho. I love simple styles and patterns but also love a good flowy dress! 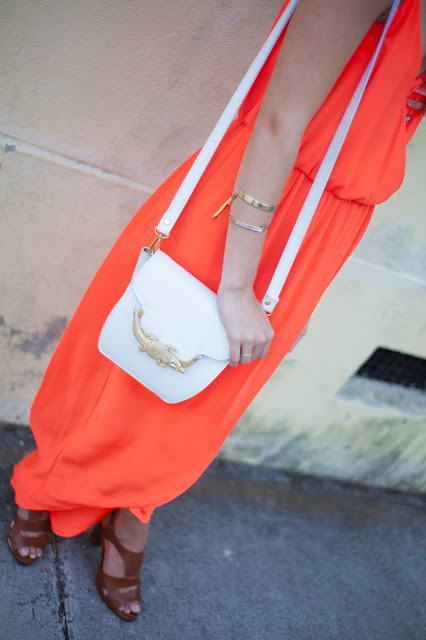 My favorite type of clothes to wear are midi dresses with either heels or slide sandals and very simple jewelry. Write down everything! Every little thought I have I write down, no matter how crazy it is! It keeps me going and some ideas can really become great ones when I start putting more thought into them. Flipping through magazines also helps too, especially with my job as a stylist. What are your favorite upcoming trends for Fall/Winter? My favorite trends I’m seeing right now are shearling vests (I just received an incredibly soft one from Entourage Clothing!) and lots of 70s vibes. My favorite boutique, 7 Gypsy, just got this amazing suede fringe skirt that I’m dying to try! What’s your favorite piece of clothing in your wardrobe right now? That’s so hard for me! I would have to say my favorite piece is this forest green tunic I recently got at Forever21. It’s a great summer to fall piece because it has thigh high slits so I can wear shorts under it, then in the fall I can wear leggings and a leather jacket! Join a community! I joined Charleston Bloggers and Southern Blog Society and both have been a great way to meet new friends, collaborate with bigger brands, and learn how to be a better blog. Also, don’t be scared to put yourself out there! Take risks and see how they play out. You may be surprised! Besides creating useful content, I would say really utilize social media. It’s such an easy tool to really drive traffic to your blog. Each time I create a new post, I post a link to it on my Instagram in the bio and all over Facebook, Twitter and Google+. I live in a great neighborhood close to a Green Way so I like to go on long bike rides and run through there. If I’m not biking, I’m typically at the beach surfing with my boyfriend (I’m still learning!) or catching up with friends at a local coffee shop or wine bar. I would love to be a full-time blogger and make my income doing that. As for now, I’m really happy where I’m at and enjoy seeing where it’s taking me! I’m incredibly thankful to be able to do what I love. I would say the day I got asked to start running a weekly fashion show. I truly felt like I was being seen and people wanted to see more of it! It’s starting to drive more traffic to my blog and such a great output for creativity. My first style icon was Audrey Hepburn and still is! I can’t say no to a good vintage or thrift store! I’m always on the lookout for some great pieces. I also like Nordstrom Rack, Forever21, and The Gap. If you could splurge on one item, what would it be and why? I’m not too sure! I would have to say something from either Chanel or Chloe. I love both of these brands and how timeless they are. Coco Chanel said it best, “Simplicity is the keynote of all true elegance,” and I completely agree with her! A perfect outfit is one that is balanced and only uses touches of accessories to highlight the overall outfit itself. This is something I try to use every day when I’m either styling myself or my shows. Thanks so much for collaborating with me Kelly! Make sure you follow her on Instagram - she posts some seriously fab fashion pics! Read my answers to the questions on Kelly’s blog!